Some say that perfect music playback is an illusion. Helmut Brinkmann however, leaves nothing to chance as he works on perfecting this illusion, thus making music playback as real as possible. Are you familiar with the term “High Fidelity”? No, we are not talking about Nick Hornby's novel, the cult-classic film adaptation or the movie soundtrack (although all three are highly recommended). We are strictly referencing the ideal of perfect music playback, in essence making it indistinguishable from the original. For Brinkmann, “High Fidelity” stands as the ultimate pinnacle of achievable sound reproduction. Simply put, there is nothing better than “High Fidelity”: after all, a facsimile can never sound better than the original. Having said that, we caution you not to be confused by the use of such marketing terms as “High-End”; “State of the Art” or “Ultra-Fi”: these terms simply stand only for what is currently technically feasible. Actually, you will be surprised to hear that one of the more funny oxymoron’s in music playback history is the so called “Hi-Fi Norm, DIN 45500 (German industry standard term)” standard. This “standard” which dates back decades is the ultimate proof that it has nothing in common with what is technically possible. So, let’s examine true “High Fidelity”: placing your favorite recording of say “Ella and Louis” on your turntable, you lean back in the comfort of your chair and close your eyes. Suddenly, Ella and Louis appear before you, in full Technicolor 3D sound. When the duet of “Potatoes” and “Potatos” comes along, you not only hear all its nuances and marvels, you quite literally see Ella and Louis perform before you, even though you know that this is only an illusion as both Ella and Louis have long since passed away. When you open your eyes, however, all you see are your loudspeakers. “High Fidelity” is a perfect illusion and High Fidelity remains our ultimate goal, even though we know that we will never reach it, as illusions aren’t real. Fortunately for us then, we appear to be pretty close to that goal, as professionals in the audio industry tell us on a regular basis. At Brinkmann, we leave nothing untried, no detail overlooked in our quest to keep improving music playback, therefore making it that much more real. Listening to the sound of tiny screws is a vital part of Helmut Brinkmann's daily routine. We have come to the conclusion that everything has an influence on sound. And we have to accept that these influences are real – even if (for the moment at least) we have no scientific explanation. Each device, no matter whether a turntable or an amplifier, has a well defined function. Good design is the reduction of the ingredients to their most essential; ideally there is nothing to be found inside or elsewhere on a device that is not directly related to the device's function. Hence we conclude that each single part of the device, no matter how trivial, has an influence on sound. Yes, even the smallest screw. One day, as Helmut Brinkmann was looking through his microscope, he noticed that the three tiny screws which serve to adjust the cantilever on an EMT cartridge are made of steel. He then asked himself whether a magnetizable material so closely surrounded by powerful magnets was really that clever of a design idea. One by one, he replaced these tiny steel screws with ones made of aluminum, brass, nylon, titanium, and many other evenmore exoticmaterials. Next, he spent countless weeks performing critical listening tests. As the listening sessions progressed, he became more and more astounded by just how much the sound quality changed as he replaced such a seemingly trivial element. After all, these very tiny screws measure just a mere 1mm in diameter! At the end of his exhaustive research, he concluded that the sound resembled the originalmost closely when only one of three screws were replaced by a model manufactured of titanium. (By nomeans is this example a one-off experience: in the end, perfectmusic playback is a careful optimization process that involves 0.1% inspiration and 99.9% perspiration. As they say, for High Fidelity to truly shine, you need patience, diligence, more patience, a dash of tenacity and of course even more patience – not to mention many tiny screws made of exotic materials). Behind Brinkmann (the brand), stands Brinkmann (the man). “You can design a technical apparatus differently, but not better”. We were unsettled by this praise of a renowned audio publication: have we reached the end? Is it really impossible to further improve upon our level of performance? Brinkmann does not build according to cost-optimizedmanufacturing processes; instead, Brinkmann is handmade. 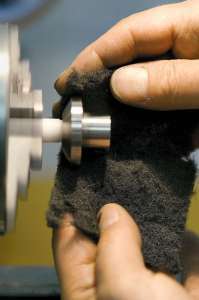 Prior to delivery, Helmut Brinkmann personally scrutinizes each and every component, making sure that every piece works and functions exactly as intended. Only this level of rigorous quality control assures that components bearing our name will meet our – admittedly very high – standards. Don't let the term “handmade” fool you, however; of course we don't really manufacture by hand. Instead, our facilities utilize only the finest high-performance machines and tools available today, which allowfor precisionmanufacturing not possible only a few short years ago. This level of precision is of utmost importance, as it allows us to build our components to the exact tolerances we have identified during painstaking listening sessions and product evaluations. As we then begin to assemble each of the parts by hand (as opposed tomassmanufacturing on an assembly line) and turn them into amplifiers, tonearms and turntables, we can eliminate any compromises from the equation. Through this process, we can leave assembly line optimizations to others and instead focus on optimal sound quality and perfect execution. The longevity of our products is a direct result of our careful and complete attention to every (tiny) detail – after all, it is our (and our customers') belief that once a Brinkmann component is made, it should ideally never return to our factory. Naturally, such level of uncompromised performance can't come cheap – even though in absolute terms, the price we charge for our products can actually be considered somewhat of a bargain, especially considering their sonic qualities and manufacturing quality. Ultimately, we vouch for this with our name; as we said earlier: behind Brinkmann the brand stands (firmly!) Brinkmann the man. Mechanical engineering by Brinkmann, or the art of extracting colorful soundscapes from black vinyl. 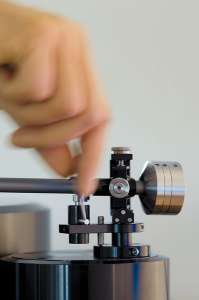 Despite continued advances in digital playback, the vinyl record (in spite of it’s limitations) remains the foremost important music format in the world. This is also especially true for Brinkmann. — Accurate and consistent speed. — High level of immunity from external and internal vibrations. — Ultimate quietness and low friction of platter and tonearm bearings. All is easier said than done, however, precisely because the groove's undulations are so miniscule in size. Brinkmann offers a complete lineup of analog playback equipment consisting of three turntables, two tonearms and one phono cartridge. Alternatively, you can of course use components fromothermanufacturers. Consider, however, that at Brinkmann, each and every component is optimized to work in synergy, hence your mileage with other components may vary. Put differently, at Brinkmann, the whole is greater than the sum of its parts. Brinkmann amplifiers and the secret of musically gifted electrons. You are right: Brinkmann is a specialist for vinyl playback. Not only, however; as it turns out, even before designing his first turntable, Helmut Brinkmann already enjoyed a great reputation for his amplifiers. Mechanical and electronic devices have a lot more in common than is commonly thought. On the one hand, because electronics play a vital role in our mechanical components (theMOS-FET heating of the platter bearing or the sonic differences between our tubed and transistorized power supplies are just two instances of this relationship). On the other hand, because resonances and other mechanical phenomena have a direct influence on the sound of an amplifier. Put differently: in order to build a superior turntable, a designer must have a profound electronics know-how. Vice versa, it sure helps the sound of an amplifier if its designer has some solid insights into mechanics as well. Perfect reproduction simply does not happen by accident. Instead, it is the result of careful optimizations. Which, for instance, is why Brinkmann defines the optimal capacitance values not only by computer but also by ear. 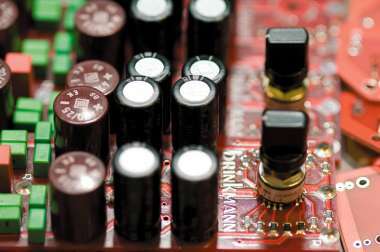 But capacitors of different manufacturers also sound different. Therefore, Brinkmann spends a lot of time not only defining the optimal values by ear, but also the make and type of each capacitor. (The same goes for all other parts, resistors, printed circuit boards or solder. Remember: everything has an influence on the sound, hence everything has to be optimized by ear.) Listening to the sound of components led Brinkmann to the insight that industrial ceramics are detrimental to good sound. When the metal oxides are sintered, they develop a tendency to resonate that leads to distortions of themid and high frequencies. Too bad we can not dispose of industrial ceramics entirely, because they are ubiquitous and found in all resistors, switches, potentiometers, tube sockets, and of course capacitors. So we pay great attention to using as little ceramics as possible in our devices – which again is much easier said than done. Brinkmann offers a wide range of preand power amplifiers as well as an integrated amplifier for all possible uses and demands of music lovers worldwide.